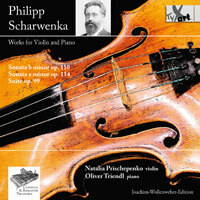 PHILIPP SCHARWENKA (1847-1917): Violin Sonatas in B Minor, Op. 110 and in E Minor, Op. 114, Suite for Violin and Piano, Op. 99. Description: Two sonatas from 1900 and 1904 by a German composer which don’t sound at all like Brahms? Believe it! A certain French spirit inhabits the outer fast movements which are light on their feet while the slow movements are also less fraught than you’d expect from, literally, the fin de siècle. The 1896 suite contains four equally not-heavy pieces: Toccata, Ballade, Intermezzo and Recitativ and Tarantella. More Philipp needs to come out from the shadow of his better-known pianist brother.